Heavy duty power bank to charge your phone or tablet, when you can't get to a home or auto charger. For people on-the-go. Slim and lightweight. An emergency charger for your phone. A perfect gift for people on the go. When you can't charge your phone at an outlet or in a car, you need this Power Bank. It is a Grade A 5000mAh battery. 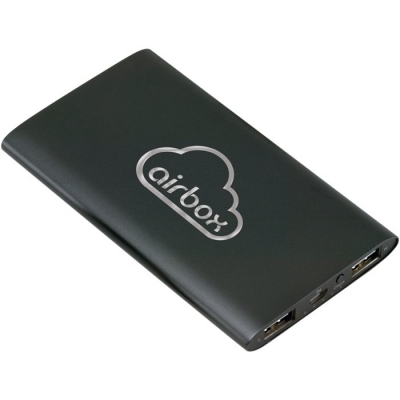 It utilizes a dual output that makes it easy to charge 2 hand-held devices at the same time. One outlet is 1A and the other is 2A. It charges most mobile phones and tablets. The lithium polymer power pack has enabled this unit to be slim in contour. To re-charge this unit, just use the accompanying 2-in-1 USB cable, which has both mini and micro fittings. You can also use the same cable to charge your mobile devices. It has a built-in battery capacity indicator. Slim and lightweight, so you can easily carry it in your pocket for emergencies. Battery Life Cycle: Can be recharged about 500 times. Price includes your imprint in one location. Imprint Method: pad printing or laser engraving or full color imprinting. Weight: 5.3 ounces without the cord. USB Charging Cable with adapter for micro and mini connections. Options: Full-color large imprint, covering the whole side, up to the edges.